Excited to join another PDX Breakfast Club meetup, this week's gathering was at Scandinavian restaurant, Broder Nord. I've been wanting to try it for quite some time, as they're rumored to have excellent, non-traditional brunch options. Totally game to try this as well as to meet new people, off I went and had a lovely experience. Although Broder Nord is a little indirect to get to and the parking situation can be tricky, once you step inside, it's totally worth it. Everything about the atmosphere spoke to me, as it truly transforms you to another world with its dark rich wood elements - everything from the beams that separate the different seating areas to rustic wooden suspended sculptures. There's even a little general store up front where you can buy local goodies and Scandinavian products. The best part of the vibe for me was how spacious everything was and the high ceilings. In a city where sometimes things can feel a bit small, this space was anything but and reminded me of trendy food establishment I'd find in a big city. Eager to sample pretty much everything on the menu, I had to curb myself of course and narrowed it down to a few options. In the end, our server helped me choose, and quite wisely at that. Forlorade Agg (Lost Eggs) - There are many elements in this dish that appealed to me including the fact that it was a savory chicken bake in an iron skillet, topped with breadcrumbs, cheese, a rich gravy and then the eggs buried deep inside. It may sound like an odd combination but it was wonderful and the ingredients worked well together. I appreciated that the eggs weren't overcooked and that the whites remained fluffy. The texture of the dish was perfect, combining soft with crunchy and not to mention all that earthiness. 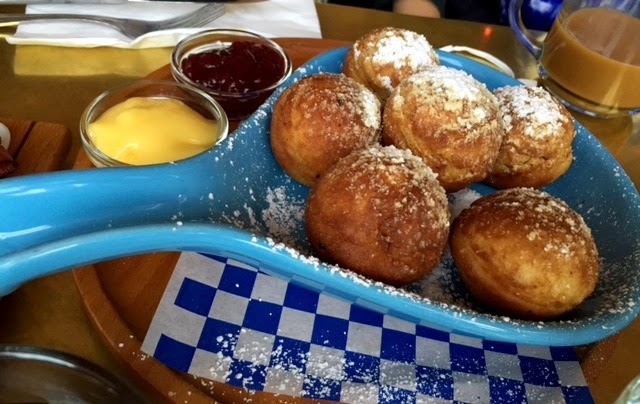 Aebelskivers (Danish Pancakes) - I've first heard of this dish back in NY but never had the pleasure to try it. A few people in our party ordered it and absolutely loved them. I had to snap the picture above and also had the good fortune of trying one fluffy pancake that tasted donut-like. You had the option to top it with homemade lemon curd or their lingonberry jam - both equally delicious accouterments. Coffee - I must spend just a little time on talking about the coffee, as it was exemplary. I tried hard to find out where they source it from (next time, I'll simply ask), but for what it's worth, it comes highly recommended. The flavor is so nutty and intense that you almost don't need any milk (and absolutely no sugar) to dilute it. If you're a coffee lover, you're not going to want to pass this up. For such a large group, our server did the best he could. It didn't take too long to get our food and he was pretty quick with the coffee as well. One thing that was a bit annoying was at the end when there was a limit on the amount of credit cards we could use. We ended up working something out and everyone walked out happy, but it was a little bit of a hassle and so much so that I'll definitely bring cash next time. Costs are moderate to expensive but definitely justified for the unique food, the lovely atmosphere and an overall pleasant experience. I paid a total of $20 including tax and tip.